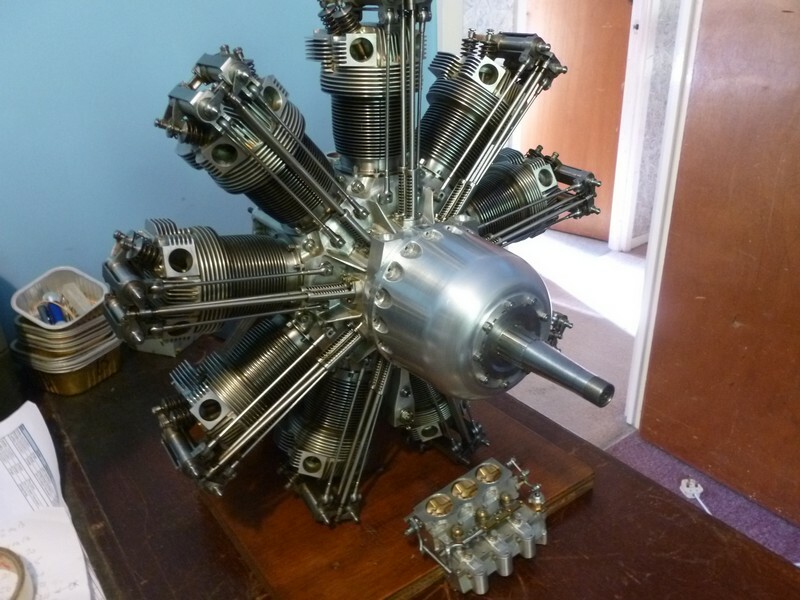 I have been given the unexpected opportunity to take over the build of this magnificent 1/3 scale replica of a Bristol Jupiter VIII FS radial engine. The engine is the work of Dan Robbin, but could easily have been the work of Faberge, it is a jewel, it is so exquisitely made. At 1/3 scale the Jupiter is huge, with a displacement of approx 840cc. My first Mini had an engine of that capacity. 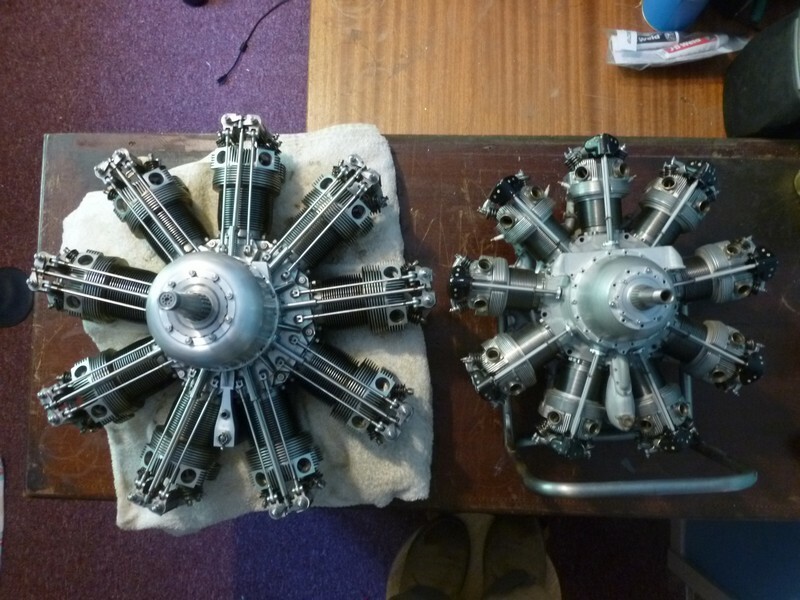 Here is the 840cc 1/3 scale Bristol Jupiter alongside one of my 360cc 1/4 scale Bristol Mercury radials. "Happiness, is a pair of big Bristols"
Great web site and amazing work. Some of the 'next page' links on www.danrobin.org/Jupiter/The_Project.html are not working. A beautiful engine Mike. How much is left to be done to finish it up?? All the ignition, twin magnetos, most of the fuel mixture plumbing and lots of little bits. The engine is only loosely assembled so will eventually need a full strip and final assembly. At my rate of progress, perhaps two years (or more) before it runs. Meantime, It will be displayed on behalf of Dan Robbin at our shows in UK. I expect the Mercedes Benz W165 Grand Prix engine to take a back seat for a while, but I will continue to post 'progress' on the W165, until the posts are up to date with the actual build. I have posted this in the Engines Showcase, but that says'no builds' . I don't think I should post in 'Your own Design' because it is Dan's work not mine. Any ideas where the build completion log should go? Mike, i would assume perhaps "Engines from Plans" or "From Castings" if castings were involved. That should keep you out of mischief for a couple of weekends at least Mike I do remember looking at Dan's site before but can't recall how or why I was there and good to see what can be done on just a Myford without a DRO in the form of the BR2. Are you able to say whey he did is not able to see the project through to it's completeing? Sorry, Jason I am sure you will understand that I cannot reveal that on an open forum. Dan's Bentley BR2 was awarded a Gold Medal at the 2002 MEX. Not bad for a self trained guy with only a Myford. The Bridgeport came later, so he could build the Jupiter. The Jupiter engine would have deserved a Diamond Medal, if there were such a thing. I would like to restart the build of the Bristol Jupiter by making the induction elbows and pipes located at the rear of each cylinder. The vertical pipe should be straightforward, it is a perfectly round thin wall tube. It is the tubular Vee shaped casting at the top which represents the challenge. There are three flanges and two 90 degree tubular bends. 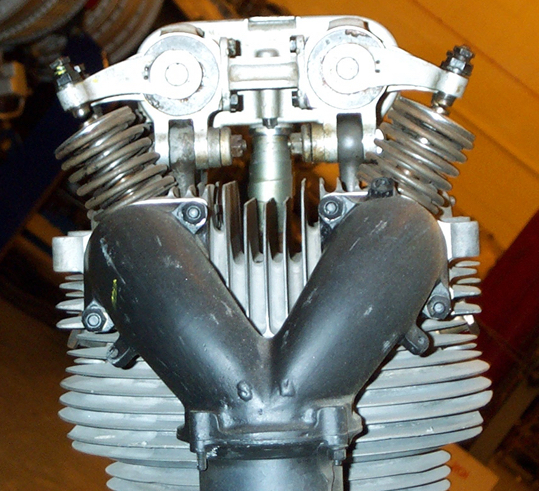 The bends transition from circular near the cylinder head to oval where they intersect. 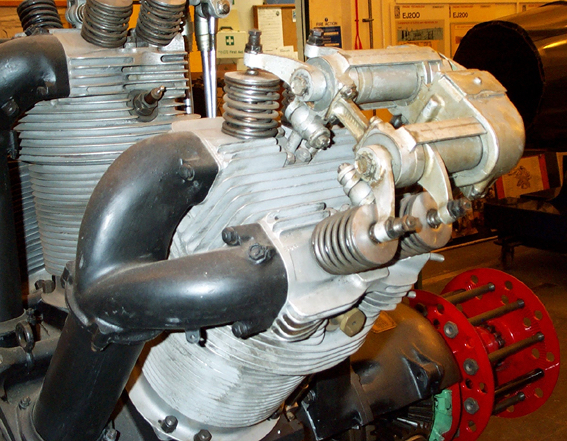 These are photos of a preserved Jupiter engine located at the RR Heritage Trust Museum in Filton. The inlet casting looks deceptively simple at first, but contains many potential problem areas and a total of nine are required. I considered machining from solid on my CNC mill. I have used this technique many times as some of you will have seen on by Mercedes Benz GP engine build log. There will be problems with the overhang of the flanges and the internal curve, preventing access of the cutter. I guess only about 75% of the surface can be reached with the cutters. This will therefore require considerable hand work with the Dremel and hand files. It will also take a considerable amount of computer time and some cleaver geometry to generate the tool paths in 2.5 axes. Once 'good' tool paths have been proven, the complex machining and hand working would need to be repeated nine times. How much easier it would be to hand carve a single master pattern and core and use a foundry to cast the nine manifolds. I can see there would be big problems with sand casting. The split line would need to bend through 90 degrees to follow the widest part of the two elbows, draft angles would be a problem as would core location to ensure a 2mm wall thickness. A certain amount of hand working would also be required but as much as with the all machined approach. I am not sure sand casting could give the casting the finesse I am looking for. Lost Wax casting may be the answer. I know it will produce casting with the required accuracy, detail and finesse. I used this technique to produce similar inlet manifold casting for my 1/4 scale Bristol Mercury radial engine. I made silicon rubber molds off the master patterns into which to inject the wax, I used a soluble wax for the core. The soluble core was dissolved out in cold water and the finished wax sent of the the foundy for investment and casting. Alas, the company I used has closed down, as have so many others. This is where I need to ask all the MEM European members for help. Do any of you know the name and contact details for a Lost Wax foundry which would be willing to work with and produce a small batch of castings for a hobbyist at an affordable price? I have found some industrial companies who are only interested in industrial quantities and who are not prepared to even talk to hobbyist. You could contact Adam at CRO fittings, he has a small stand at Guildford. If you give him your CAD drawing then he can get the part wax printed and cast, he mostly does his own stuff but I think may be willing to do custom jobs, I think Jo has talked to him more about this. There is also Abby Castings who could probably do it. PS what sort of sizes are these bits as that can sometimes limit who you can go to as it has to fit their flasks, maybe a couple of pics of the engine with something next to it would help give us an idea of the engines size. PPS did you ever get a price back for the remaining 3D printed material on your list? I guessed you would be the first to reply. Thanks for the advice. I will follow up on each of those leads. I would prefer to produce the waxes myself. It should mean less outside work to pay for and I can be satisfied with the waxes before it is invested. Each inlet manifold measures a bit under 2.5" x 1.5" x 1.5". I have a gas fired melting furnace but it is the burn out furnace which is the killer. Temperature stable at about 600*C for twelve hours. 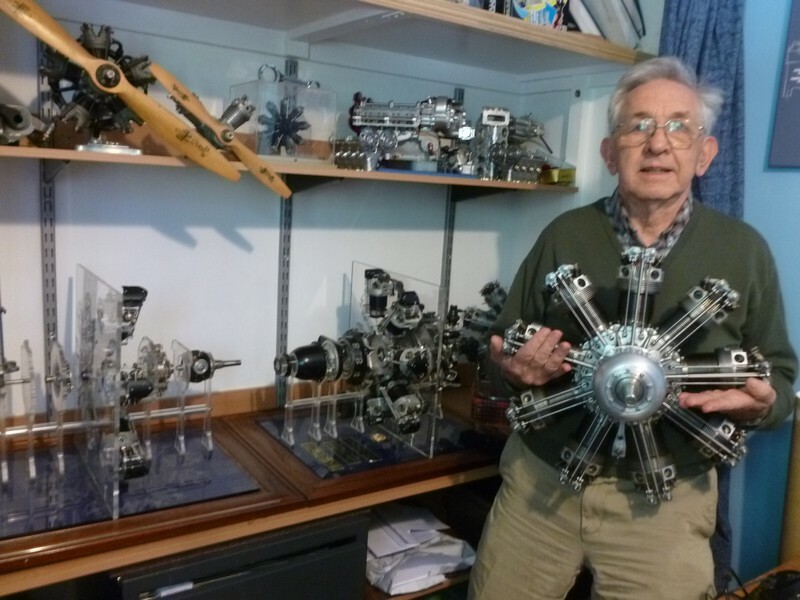 Here is a photo to give you all an idea of the size and weight of the 1/3 scale Bristol Jupiter. Bad Behavior has blocked 16603 access attempts in the last 7 days.